Someone recently asked a question in a Puppeteer issue “Can we use Puppeteer to interact with a Devtools panel?”. The user wanted to be able to test a Chrome Extension in the DevTools UI. There is already a way of testing the background page, by grabbing the page associated with the background_page target. See Working with Chrome Extensions for an example. However, there is no API for interacting with the DevTools UI. Puppeteer uses the low level Chrome DevTools Protocol to interact with the browser and pages. The Chrome DevTools Protocol allows for tools to instrument, inspect, debug and profile Chromium, Chrome and other Blink-based browsers. Many existing projects currently use the protocol. The Chrome DevTools uses this protocol and the team maintains its API. The UI part of DevTools is a separate project, and so there are no low level APIs exposed for interacting with it. The important thing to understand is that the DevTools UI is just like any other web app, which means we can load it up in a browser tab and interact with it with Puppeteer. To start with, we will use Puppeteer to load the DevTools UI in a new tab. This might look confusing at first. On the left-hand side is the DevTools page we loaded, and on the right-hand side is the attached DevTools. This means we can use the DevTools on the right to inspect the DevTools UI on the left. Crazy stuff 😲. You can do this in a normal browser by undocking DevTools and then pressing Cmd + I. This is all cool and it’s useful for debugging problems with the UI itself, but we have no data. What we need is to connect the UI up to the page via the DevTools Protocol. The way this is done is to connect a WebSocket to the backend. The UI and the backend will send and receive messages using JSON, and it’s these messages that allow DevTools UI to interact with a page. Firstly we grabbed the WebSocket endpoint that Chromium created when we launched the browser. This will output something like ws://127.0.0.1:50037/devtools/browser/cd4a63c8-c18e-4a4d-be66-552ce629236a. This is the browser endpoint, but there is one exposed for the page we want to inspect. We obtain the identifier by getting the _targetId from our Puppeteer page. Finally, we build the full debugging URL by providing the page WebSocket endpoint as an argument to the bundled DevTools app. If we then navigate to the BBC News website, the DevTools UI will receive data about the page. Modify the launch arguments reference the unpacked extension code. Select the Adblock Plus tab in the UI. This is somewhat hacky, but what this does is continuously press Cmd + ] until the the right panel is selected. Note the [aria-selected="true"] attribute selector on the tab. If you are wondering why the selector is really long and complicated, it’s because DevTools UI uses Shadow DOM. It does make it difficult selecting elements from an outer scope (for good reasons). 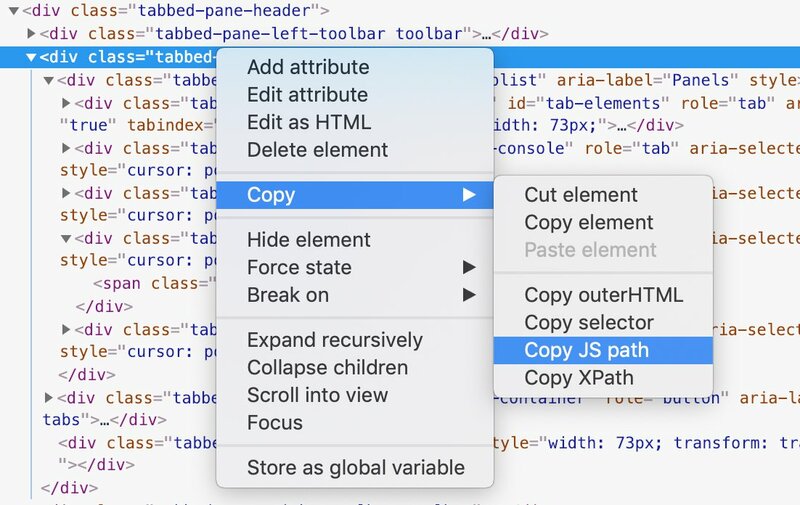 However, Chromium 72 added the ‘Copy JS path’ option to generate a selector statement for selected element. This makes this simpler. Even though we are getting new network requests etc. in the main DevTools UI, we are not getting any blocked requests in the Adblock extension panel. Something has gone wrong. I think the problem is that Adblock attaches to a particular tab, and since we are running the debugger in a new tab, it’s not going to receive messages about the other tab. Whether this is a problem for all extensions or just some I don’t know. It looks as though the communication mechanism with extensions is complex. See Extending DevTools for details. At this point, I gave up trying to get it to work, as it’s a whole new area for me. I will likely revisit this when I know more about Chrome Extensions - a new excuse to create my own.